Fall finally found Southern Utah and I couldn’t be more pleased. It’s downright chilly when we walk to school in the morning and all I want to make is soup and chili. I am a total soup lover and Henry, my happy second child, is right there with me. The rest of the family likes it fine but they aren’t crazy about it like Henry and I are. So in an effort to keep everyone happy and full I plan on serving some kind of awesome bread to compliment a soup/chili/stew meal. 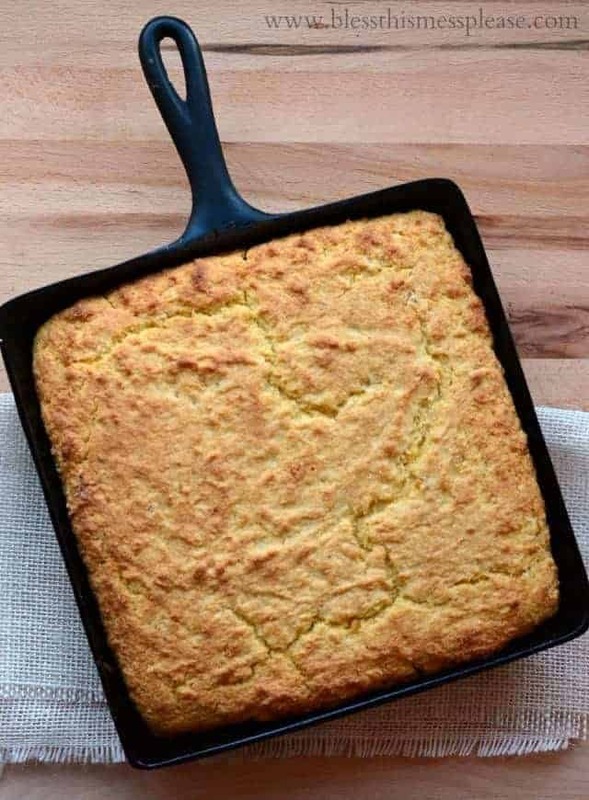 Cornbread is one of my favorite sides to make for a soup meal because everyone loves it and it only takes about five minutes to get it in the oven. 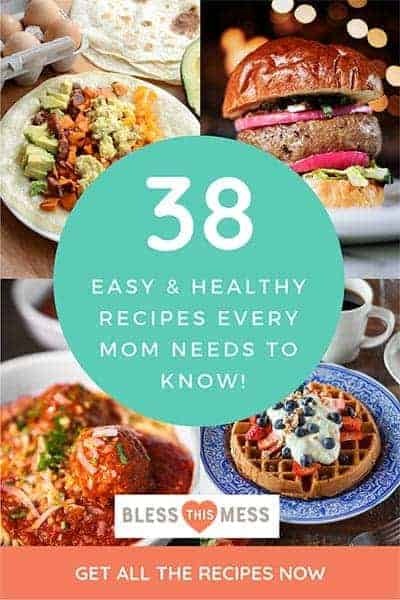 This recipes is a little different from my normal go to cornbread recipe because you add a can of creamed corn. This is a trick that I learned from one of my Indiana aunts and it’s a fun little change from the usual. The creamed corn makes the cornbread extra sweet and creamy. Add a little honey butter on you’ll be in heaven. So next time your making a batch of chili plan on serving this on the side. Five extra minutes of effort never tasted so good. 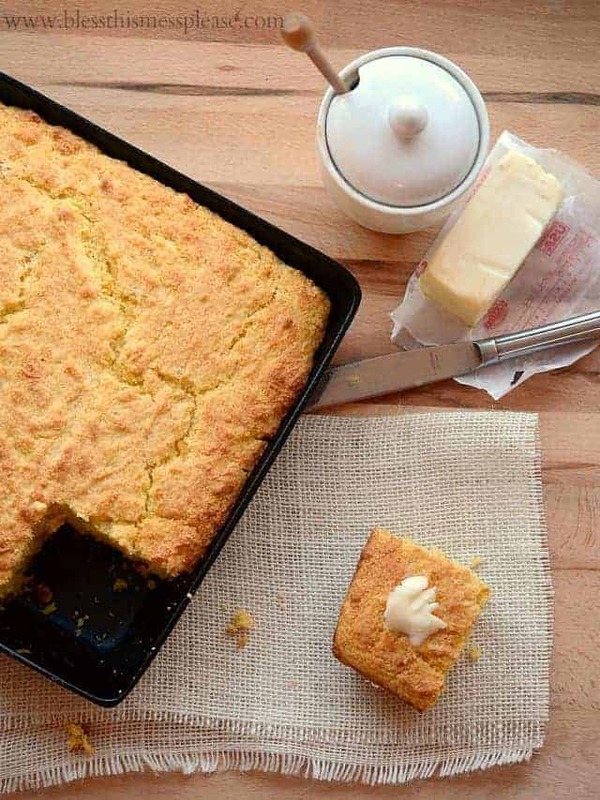 The creamed corn in this easy cornbread recipe makes the cornbread extra sweet and creamy! Preheat the oven to 425 degrees. Grease a glass 9×9 baking dish, 9-inch pie plate, or cast iron skillet. In a large mixing bowl add the flour, cornmeal, sugar, salt, and baking powder. Whisk to combine. Make a well in the center of the dry ingredients and add all your wet ingredient. Stir to combine just until the mixture comes together. Pour batter into prepared pan and bake until the center is set, the top is golden brown, and a toothpick inserted in the center comes out clean, about 25 minutes. 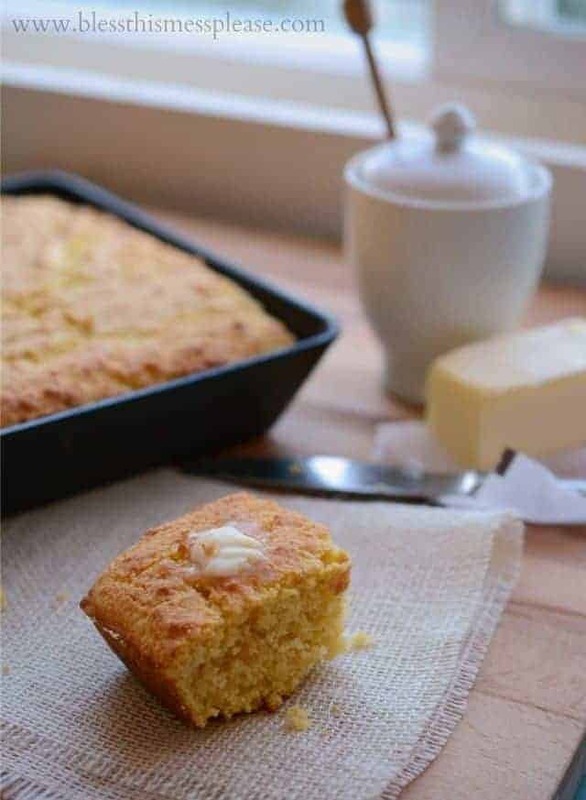 Let the cornbread cool for 5 minutes before serving warm with butter and honey. The colors around town are just starting to show through but on the mountain, about 40 minutes from our house, they are in their full fall glory. Thomas and I snuck up to the mountain this weekend for a quick overnight date. It was so fun to stop and take a few pictures without feeling like we had to be somewhere. We were only gone for a night and a day but it was just the thing this mama needed to recharge her batteries. The last time we spent the night without the kids we were having a baby and the time before that was years ago. I’d like to think we’ll do it again soon, but let’s be honest, it’ll probably be years until we do it again. Oh well, I sure did enjoy it. When was the last time you spent the night away from your kids? Overnight date? What! That sounds fantastic! Last time I was without kids with my husband was during childbirth 🙂 Time before that was January of 2013, I was 5 months pregnant and Nate convinced me to go snow camping with him. It was surprisingly awesome! 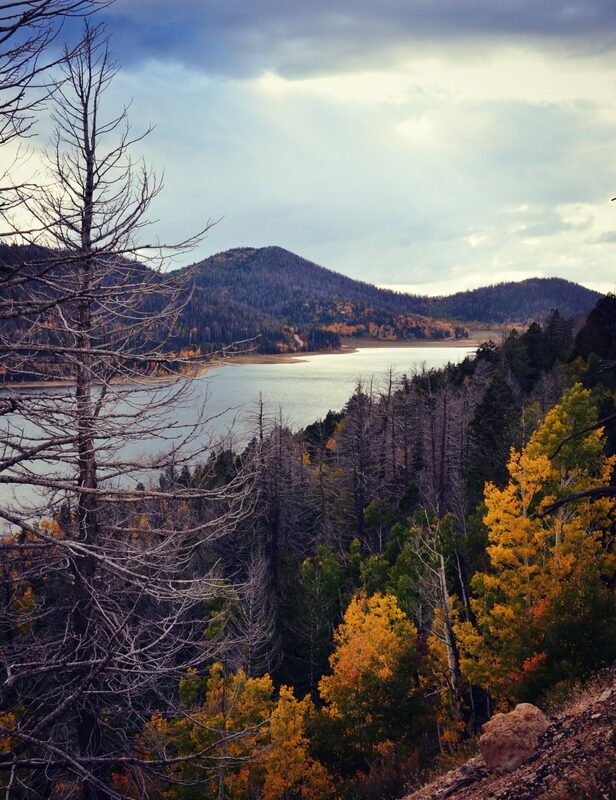 I love all the fall colors, thanks for sharing those gorgeous photos! We don’t have trees quite like that here in CO, but I really miss the midwest falls-they are the most beautiful of all! I am planning to make chili for Game Day Sunday, this will go great with it! Can’t wait to try the cornbread! LOVE that pic- you should sell it as a print! At least blow it up & stick it in a free at your house. Can you imagine one like that for each season that you rotate?! I’ve never been away w/my hubby except at the hospital having a baby, but I went on a stake women’s retreat to the Heber girls camp & it was amazing (perfect fall/summer weekend weather wise). I just brought my pump & Rob & all the kids survived w/o me. Glad you guys could get away-especially after all the hardwork of opening the hardware store. Wow!!! 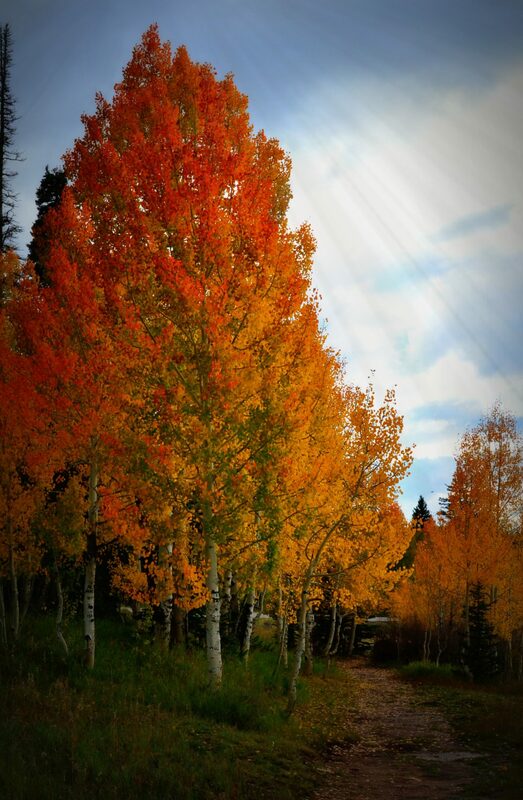 Those trees….I just love fall, almost as much as I love cornbread! Totally dying that you commented Kristen. Thank you, it made my day. 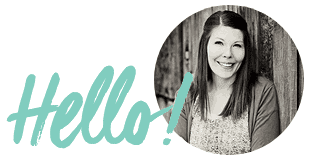 And I’m so looking forward to meeting you in KS at the end of the month!! I made this recipe and it was so moist and tasty. 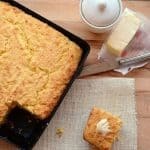 I have made three other cream corn cornbread recipes but this is my favorite. My family can eat a box and a half of jiffy cornbread but this is so filling they only ate one piece. I baked it in an 8″ dark metal round cake tin. I baked it for 30 minutes but the middle was still a little under cooked. After cutting into 12 pieces I took out the middle 4 and microwaved them 3 minutes. I also add honey to the top as soon as I remove it from the tin. Next time I make this, I will I just make 4 muffins in my cupcake tin to offset my smaller baking dish. Yes there will be a next time.